If you want to prevent dirt in your home then you should check out this Harry Potter wizards welcome doormat. 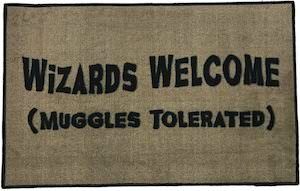 The doormat has a black edge and a cream color with on it in black letters the text “Wizards Welcome (Muggles Tolerated)”. 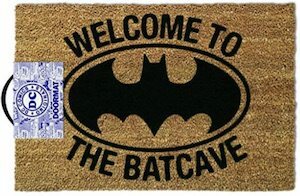 So a true Harry Potter fan understand what this doormat is all about and will wipe its shoes before entering your home. The Harry Potter doormat is 2 x 3 feet in sizes and made for indoor use so don’t put it out in the rain and snow because then it may not last very long. If you like to welcome Star Wars fans to your home then you just have to check out this Yoda doormat. 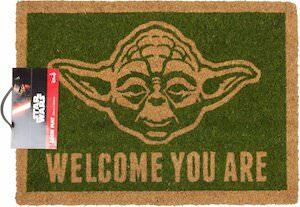 The doormat has the face of master Yoda on it and below his head it says “Welcome You Are” in the typical way Yoda would say it. The Star Wars doormat is made from 58% polyester and 42% coconut and it is 60 x 40 cm making it just he perfect mat for in your home especially if you are a big Star Wars fan. No there will be less dirt in your home because a Star Wars doormat is great for wiping your dirty shoes on. If you like Rick and Morty and hate dirty feet then you just need this Rick and Morty doormat. The doormat is round and has a 23 inch diameter. 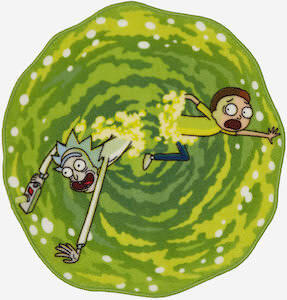 On the doormat you can see a green portal and you can see that Rick and Morty are sucked into the portal. Having this cool doormat in your room will prevent dirt because you can wipe your feet or you could use this as a fun mat to decorate you room. Now just watch out that you are not sucked into the portal because you will never know what adventure you are getting into. Now there is a Darth Vader doormat and that doormat is perfect at keeping the dirt outside. 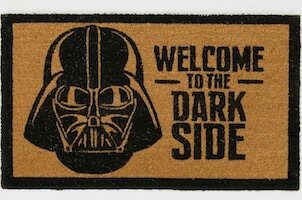 The Star Wars doormat is 17 x 29 inches and is made from coir that gives it the typical brown background color and the on that you can see the face of Darth Vader and the text “Welcome To The Dark Side” and there even is black border to frame it all in. Just imagine this doormat in front of your door, everyone will know that you are on the Dark Side and that you like your home clean as they now can clean their boots and shoes on this Star Wars doormat.